I will confess I have been somewhat distracted. Mainly by Steinbeck and Robinson and so it’s taken me while to get back to Chris Wright. But sitting here off work on the sick for a day to give me close proximity to a toilet, has given me the chance to catch up a bit. 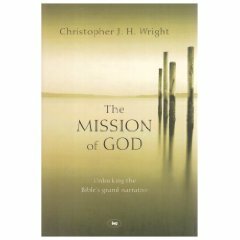 In this penultimate chapter Wright covers GOD’s vision for the nations in the OT. From sunday school memories I remember a lot of violence, a lot of blood shed. In fact if you asked me to recall what happened in the historical narratives of the OT then that is what would immediately jump to mind. The violence and the judgement happened, but it would be negligent to say that that was all that was going on. Although hardly unexpected the Bible gives a somewhat fuller and more nuanced account than what I seem to have immediately retained. Here Wright articulates how the Mission of GOD involved and included the pagan nations of the OT accounts. He uses the example of the story of Jonah – which we see as the reluctant missionary who is eventualy persuaded. Perhaps because this is the closest thing we can find in the OT that looks like mission to us. It is here that we see GOD correcting Israel’s opinion of themselves. Yes – you are my chosen people, but chosen to fulfil my mission. So why then all this focus on Israel- revelation. The fact that YHWH has revealed himself in word and deed and person to Israel. If they are special of favoured then this is why. Israel stood visible to the nations, at the crossing point of the great civilisations, as conquerors, conquered and exiles they were visible as the people to whom the living GOD had revealed himself. Their ethical responsibilities were to reflect the revelation they had received. I will take the blood from their mouths, the forbidden food from between their teeth. And the remnant, even it will belong to our GOD. And it will be like a clan in Judah, and Ekron will be like the Jebusites. The Philistines – the nasty Philistines that we’re forever hearing about in the OT – even they GOD wants a remnant of. Note that this same hope of a remnant is exactly the same hope offered to Israel. And it is in verses like these that we now see where Paul was coming from in his mission to the gentiles. It was of course not his mission – it was the mission GOD had been pursuing since the beginning. Health is so much more than medicines and tests and doctors. We doctors may be the main determinants of healthcare costs (often unnecessarily) but we are certainly not the main determinants of health. Even the non-medics will find this kind of cool. Anyone fancy doing it on their local, friendly, useful med students? This is the x-ray i took on Friday morning. 93 year old lady (background of chronic lung disease, but in pretty good nick considering, gets out and about once a week, no other co-morbidities) , short of breath for a week, worse on the day of admission. She was breathless but alert, orientated and able to speak. Minimal air entry on either side of the chest, normal BP and heart rate, no distended neck veins. 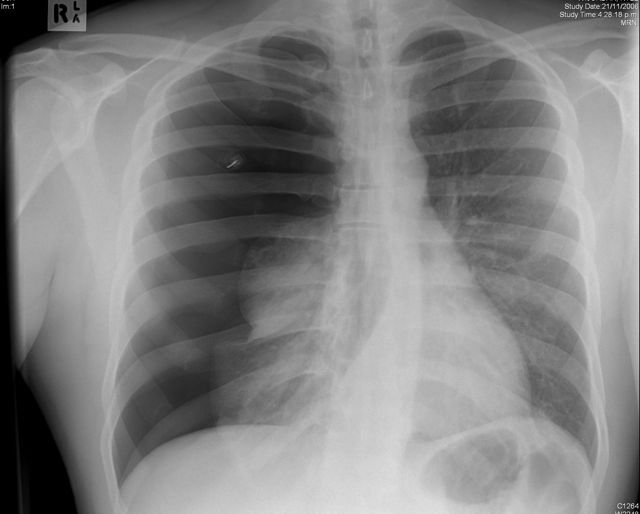 Mild to moderate type II respiratory failure on her gas. Seemed like a good candidate for non-invasive ventilation. Got a quick CXR and popped her on the ventilator while waiting for the film to print out. After 10 minutes on the vent she’s improving, less work of breathing, resp rate dropping. 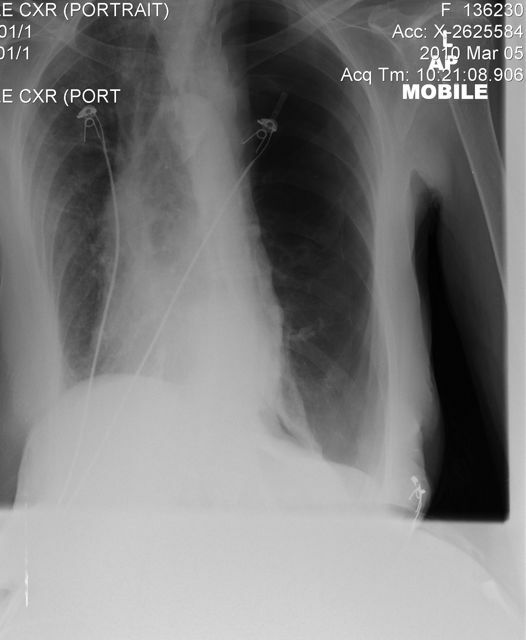 X-ray comes back and yes of course there’s the tension pneumothorax. So what about the x-ray you’re never meant to take? Most medical dogma is just that. Based on cliche and things grey haired consultants say on post-take ward rounds. They have little relevance to real world medicine. In the real world of frail, crumbly elderly patients (and this is a large part of our population, not the young professionals of ER and House) “classic” presentations are rare and examination findings in acutely sick people are frequently unreliable. If you work in emergency medicine long enough you learn quickly not to make dogmatic statements or speak with too much certainty. If you have no room for doubt and uncertainty then find another job. One of my last referrals last night was a 52 year old lady whose Dad died at the age of 50 with an MI and with chest pain that just might have been ischemic in nature (we see 20 of these patients a day and maybe one of them rules in for ischemic heart disease). I wanted her admitted for serial ECGs and enzymes. The response of the medical reg was the she was too young to have anything significant. I suggested that we should have told the patients father that when he died at the age of 50 with the same symptoms. Medicine is a complex and often unpredictable beast and as much as we’d like it to be it’s not nearly as scientific as we’d like it to be.